In the pursuit or contemplation of international commercial activities, numerous questions of law arise. These volumes in the International Encyclopaedia of Laws answer these questions in a single resource. 'Commercial law' covers merchants' status and obligations (such as bookkeeping), their bankruptcy, and their instruments for business. 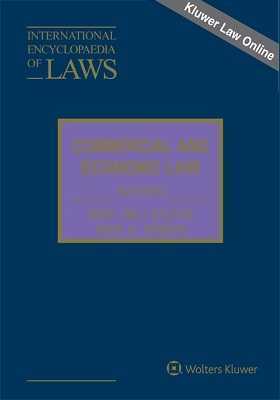 'Economic law', a relatively new legal branch, deals with state intervention in economic activities and includes law of establishment, law of competition, and state regulation of conditions of commercial transactions. Specific topics covered in this work include broker/client relations, contracts affecting competition, and government taxation incentives for economic activities. This concise work provides a regularly updated source of key information, written by experts in the field, at both the national and international levels. It is therefore an invaluable resource for both academics and practitioners. For more information and an up-to-date list of the countries for this looseleaf, please visit KluwerLawOnline. List of Abbreviations. Preface. General Introduction. Selected Bibliography. Part I: Commercial Law. 1. Concepts and Sources of Commercial Law. 2. The Economic Operators. 3. The Economic Institutions. 4. General Obligations of Economic Operators. 5. Business Assets, Goodwill and Commercial Property Rights. 6. Bankruptcy and Related Institutions. 7. Negotiable Instruments (Bills of Exchange, Cheques, etc.). 8. Stock and Commodity Exchanges. 9. Commercial Contracts. 10. Commercial Securities. Part II: Economic Law. 1. General Principles. 2. Law of Establishment and Supervision of Economic Activities. 3. State Incentives for Economic Activities. 4. Competition Law. 5. State Regulation of the Conditions of Commercial Transactions. Index.